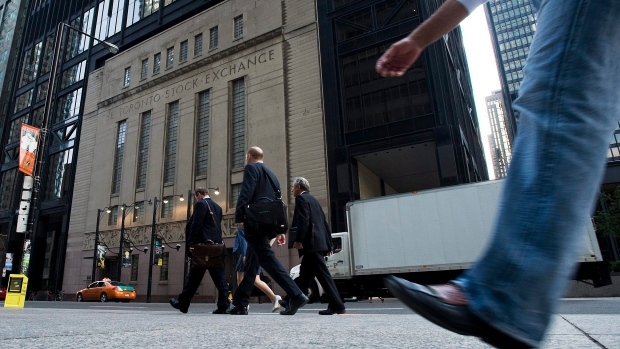 TORONTO -- The industrials and technology sectors helped Canada's main stock index close higher Thursday, while U.S. stock markets moved lower. Canadian Pacific Railway Ltd. (CP.TO) climbed along with aviation and other rail companies after the company showed strong results in its earnings after markets Wednesday. The industrial sector index, which closed up 1.14 per cent, looks to be benefiting from a strong economy across North America, said Allan Small, a senior investment advisor at HollisWealth. "When you have an economy in North America firing on if not all cylinders then pretty close, you can extrapolate to the rails, they're the ones that carry the goods all around." A boost to the utilities, consumer staples and other sectors also helped the S&P/TSX composite index close up 65.61 points at 16,543.01. U.S. stocks were hit by concerns about trade tension as congressional hearings on auto tariffs got underway, said Small. "I think more talk overnight and early this morning about auto tariffs, etc. I think that took down U.S. markets." In New York, the Dow Jones industrial average closed down 134.79 points at 25,064.50. The S&P 500 index was down 11.13 points at 2,804.49 and the Nasdaq composite index was down 29.14 points at 7,825.30. Trade tension could have also played a role in pushing down the Canadian dollar, which averaged 75.44 cents US for a dip of 0.29 of a US cent Thursday. "All these trade talks, trade wars, the idea that the U.S. President could put tariffs on automobile parts and automobiles in general. There's been more talk of that recently, so I think trade worries brought down our dollar," said Small. He said confidence that the U.S. federal reserve will continue to steadily increase rates has also strengthened the U.S. dollar against other currencies. The September crude contract closed up 49 cents at US$68.24 per barrel and the August natural gas contract was up five cents at US$2.77 per mmBTU. The August gold contract ended down $3.90 at US$1,224 an ounce and the September copper contract was down six cents at US$2.70 a pound. Peregrine Diamonds Ltd. closed up 7.5 cents, or 46.88 per cent, at 23.5 cents after De Beers Canada Inc. signed a deal to acquire the company in an offer valued at $107 million. Under the deal, De Beers will pay 24 cents per share for the company, which owns the Chidliak diamond project located 120 kilometres from Iqaluit.